Points Nécessaires : 23300 Software is not compatible with mobile and tablet devices. Please add this title to your Wish List and sign on to your the first club account from a desktop computer to complete your redemption. ABOUT THE SOFTWARE Heimdal PRO protects users against attacks that antivirus can’t block Heimdal PRO is a cyber threat protection suite that includes 3 layers of protection against ransomware, financial Trojans, data-stealing malware and other threats that antivirus can't detect. Heimdal PRO is powered by 3 engines that ensure: real-time traffic scanning – protection against Zero Hour e… xploits, dangerous web locations, malicious content from legitimate websites and cybercriminal attacks. detection and blocking of advanced malware attacks – blocks confidential data leakage and data exfiltration to cybercriminal-controlled servers. automatic and silent patching – keeps your security-critical software up-to-date, blocking over 85% of attacks that target software apps. Heimdal is compatible with any Windows environment from Windows 7 to 10.HEIMDAL PRO VS ANTIVIRUS Heimdal PRO is especially effective against financial malware and the most sophisticated forms of malware, which go undetected by antivirus solutions. Heimdal looks at traffic, whereas antivirus looks at local files, which is why Heimdal PRO is the best addition to any antivirus product on the market, and an essential asset for your online safety. KEY FEATURES Protect your computer from 2nd generation malwareHeimdal PRO is a security suite that protects users against attacks that antivirus can’t block. Heimdal scans all your incoming and outgoing Internet traffic for cyber threats, blocking them before they penetrate the system. This includes HTTP, HTTPS and DNS traffic. Save time and enhance your security with automated software updatesBy constantly patching vulnerable software, Heimdal ensures increased security levels against ransomware, financial Trojans, data-stealing malware and other threats that antivirus can't detect. Keep your financial data and confidential information safe Heimdal PRO is especially effective against financial malware and the most sophisticated forms of malware, which go undetected by antivirus solutions. Heimdal looks at traffic, whereas antivirus looks at local files, which is why Heimdal PRO makes a perfect addition to any AV products, and is compatible with all AV solutions. Protect your digital life from attacks you don't even noticeTo reach more potential victims, cyber criminals hack legitimate websites and online ads and even impersonate brands you trust and love. 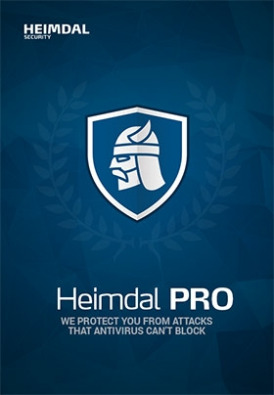 This keeps their infection tactics covert and makes you click on things you shouldn't click on.Backed by a strong intelligence database, which is constantly updated with data on the newest threats, Heimdal PRO provides the proactive security layer that is necessary to fight the most sophisticated cyber threats and attacks. Experience a safer web, just as fast We created Heimdal PRO to be discrete and effective, so it doesn't slow down your system or your Internet connection. You won't even feel it's there when you're browsing the web, but the results in the Activity Reports will show you it's working 24/7 for your protection Keep your data safe from exfiltration, conduct financial transactions with peace of mind and keep your system up-to-date with Heimdal PRO! SYSTEM REQUIREMENTS Compatible with: Windows 10 (32 and 64 bit), Windows 8.1 (32 and 64 bit), Windows 8 (32 and 64 bit), Windows 7 (32 and 64 bit) Microsoft .NET Framework 4.6.1* Hard Drive: 25 MB disk space Local administrator rights during installation User rights during execution Internet access *If .NET Framework 4.6.1 is not already installed, Heimdal will automatically download and install it. Copyright © Heimdal Security A/S. Heimdal is a registered trademark of Heimdal Security A/S. Heimdal PRO and all intellectual rights pertaining to this software are owned by Heimdal Security A/S. The Heimdal PRO software may not be copied or used except as permitted by the License agreement found at https://heimdalsecurity.com/en/license. The represented texts and graphics are only intended to provide information about Heimdal Security products and contain copyright­protected material. Reproduction and distribution of this material is therefore not permitted and shall require the express permission of Heimdal Security A/S.